I've read the book several times. But, when I saw that my library had the audio I just couldn't resist. I love this book so hard. It is just hilarious!! Samantha's inner dialogue is so relate-able! I know I've had those same conversations/thoughts with myself. Narrator Phoebe James is genius. She does so many different voices that made me feel like I was watching the film. 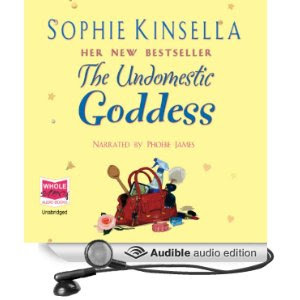 Sophie Kinsella always writes career women. I love it. It sets a fun backdrop to the story. Samantha is a high powered lawyer that screwed up. Big time. Then she runs away. Don't we all wish we could do that?! When she starts being the housekeeper I couldn't stop laughing! There are just so many funny situations. This book is just awesome and I'm so glad I grabbed the audio even though I already knew the story. It added another dimension. Plus, I could always listen to an English accent. It's so sophisticated! I keep meaning to try this one on audio. Glad you liked it! I love Sophie Kinsella! She's one of my favorite authors, and I truly do think her heroines are always entertaining and lovable.